Women's small zip around wallet from New York-based label, Coach. Crafted from polished pebble-textured leather with Western-inspired cabochons and Tea Rose rivet detail to the front. 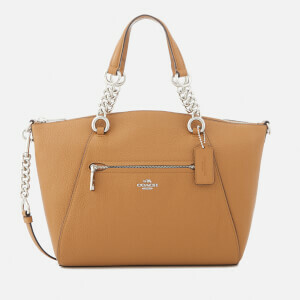 The purse opens to reveal a smooth leather interior with two card slots, a note compartment and a zipped coin pocket. Features contrasting trims and signature appliqué branding. Silver-toned hardware.